The danger of traffic accidents in off-road zones has arose as a growing controversial issue. An off-road zone is an area classified as private and thus is not subject to the Road Traffic Act such as apartment complexes and university campuses and Hanyang University (HYU) is not an exception. Therefore, students are threatened by fast cars on the road in front of Hanyang Cyber University. Additionally, at the area between the College of Social Sciences and the Paiknam Library, delivery motorcycles and taxies have been seen driving at a high speed and sometimes even crossing restricted areas, leading to traffic problems. More students are starting to feel uncomfortable about cars driving dangerously and illegally in the school campus. In such a situation, measures to protect HYU students from road problems should be of utmost importance. Therefore, the school needs to think about ways to solve this problem through discussion amongst the school members. 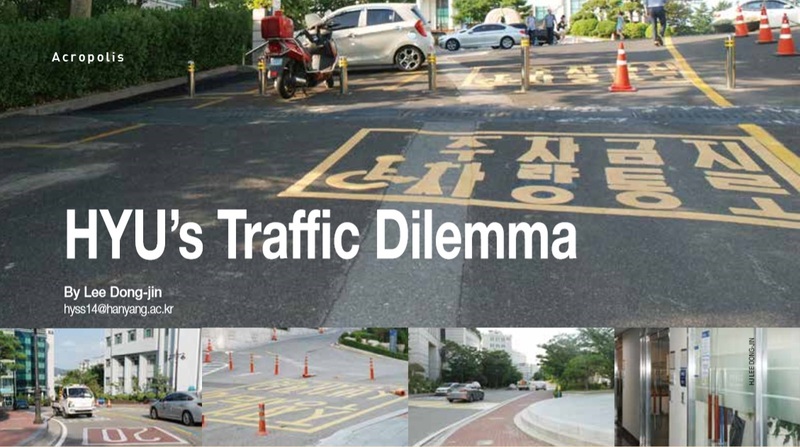 According to a survey conducted by The Hanyang Journal, 50 percent of the students said making more transportation facilities is the most urgent matter. There were also other responses where around 17 percent of the students answered that an increment of workforce in traffic management is necessary, and 23 percent of the students stated that a change in the traffic management policy is needed. These results show that overall, students are unsatisfied with campus traffic management in HYU’s campus. According to the HYU Security Team, traffic in HYU is managed by a subcontractor dividing the school into several sections and placing traffic management employees in each zone. However, such policies have not yet solved school traffic problems. HYU’s Campus Security Team located in the Administration Building is in charge of the traffic management at the moment. After the subcontractor that takes care of traffic at HYU divides the school into several sections, they place the traffic guides in each section. The shifts are from 7 a.m. to 3 p.m., and from 3 p.m. to 11p.m. and there are several others guides who work throughout the night. The traffic guide office said that the transportation guides will focus more on arranging people in a flexible manner depending on time and location. Also, they added that even officials at the Campus Security Team will help on-site when there are many vehicles. “The team is fully aware of the students’ complaints and are trying to address them. But the biggest problem is that there are no legal means to enforce penalties on fast vehicles or the drivers who drive in campus. And because of this reason, although new signs have been installed, the vehicles easily ignore them,” said Kim Hyun-min, a staff member of the Facilities Management Team. Furthermore, he mentioned that they are also trying to improve HYU’s traffic conditions by asking people to refrain from using their cars when an event takes place on campus, as well as working with the Human Rights Committee for Disabled Students to know their concerns. However, despite this effort, the team acknowledges that they still lack in communication with the students and thus, has asked them to voice any complaints they have to the Property Management Team at the Office of Facilities Management. They also pledged to do a thorough review with the Facility Management Team on ways to expand facilities and increase manpower. ​Due to the impossibility of legal regulations related to these issues, it is important for the university and the students to work together. Students should be able to contact the Campus Security Team immediately if there are any inconveniences or suggestions to improve traffic safety on campus. Considering the opinions of HYU students and the traffic guides about the current problems associated with campus traffic management, the school should make more efforts to expand the workforce and install facilities to solve such problems.